The ASHA congress will be held from September 20th to 22nd in Orland, Florida. Carstens Medizinelektronik will be present. You can find us at booth 1461. We are looking forward to meeting you there. 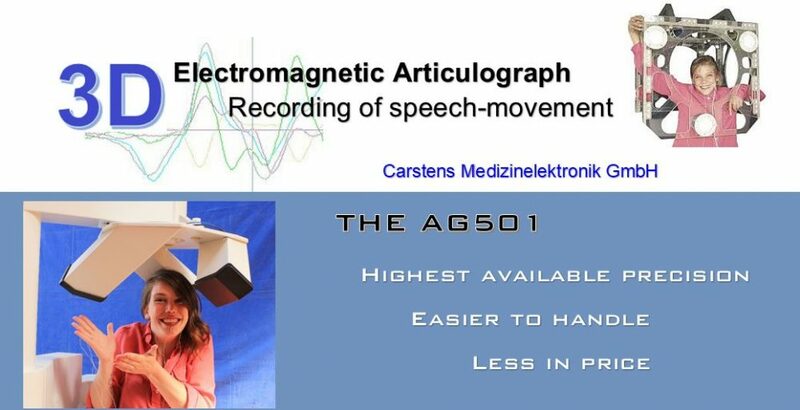 Carstens Medizinelektronik offers the opportunity to see the new 3D Articulograph AG501 at a workshop at the 10th International Seminar on Speech Production (ISSP 2014) which is held from Monday 5th May – Thursday 8th May 2014 in Cologne. We will present the latest Carstens’ Articulograph AG501. The workshops usually include several presentations by scientists with many years of experience in the usage of the Carstens’ Articulograph. You can expect to see a test measurement and get tips and tricks regarding the application of the latest model AG501. Note that the workshop itself is free. For information on accomodation and fees regarding ISSP 2014, please see their website. The EMLAR X will be from April 14th to 16h, 2014 at the Utrecht University. Workshop description: This workshop will introduce you to 3D Electromagnetic Articulography or EMA as it is currently used in spoken language research. EMA is a kinematic tracking technique to measure articulatory movements. A set of transmitter coils produces a magnetic field that generates currents in tiny sensors placed on the surface of the articulators. As the sensors move through the field, they are tracked by computer. In the first hour we will demonstrate the procedure from set up to measurement together with the accompanying software and discuss the ins and outs of the experimental setup. In the second hour, participants will get hands-on experience with data analysis and we will give some theoretical background on the different measures and some examples of how they can be used to study speech and language development.. The high-precise Articulograph AG501 will be presented at the Jahrestagung der Deutschen Gesellschaft für Phoniatrie und Pädaudiologie (DGPP) in Bochum. The congress lasts from September 20th until September 22nd 2013. For further information on the congress please see the official website of the DGPP. On August 30th, a special satellite workshop of Interspeech 2013 will be held at Institut des Sciences de l’Homme in Lyon. The workshop will deal with articulography in particular. Carstens Medizinelektronik presents and demonstrates the latest Articulograph AG501. The Articulograph AG501 will be presented at the Interspeech 2013 which is held in Lyon in France from August 25-29. August 17-21, 2011. Hong Kong SAR, China.